Siesta Vacation Rentals, LLC take your privacy seriously as we do ours. We pledge to protect all personal information you provide us with state-of-the-art encryption. To best protect your privacy, we believe in full disclosure about how information is used to improve the services we offer you. We analyze and track interest in our properties, where people click on our website and more. This helps us to continue to improve our website and the information we offer. We never release any personal information, only collect information for the improvement of the services we offer. For your convenience we link to other websites for additional useful information to help you. Whether it be fun things to do, or baby rental equipment, our website is designed to help you find the information you need. We do not own or control these other website, therefore we cannot be responsible for any information they collect. 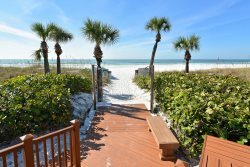 Siesta Vacation Rentals, LLC disclaims any responsibility for the content of those websites, products or services maintained and owned by others. We cannot guarantee these other websites work or will function property, including our own website and from time to time the internet can cause disruptions to the functionality of our website and others. Any website has the potential to harm your computer or may contain viruses. We reserve the right to update our policy from time to time. We will post our updated policies on our website.